Aim: To evaluate changes in performance and meeting targets in managing patients with suspected lung cancer after setting up an early diagnosis clinic—“two-week rule” (TWR) clinic. Materials and Methods: Retrospective analysis of 210 consecutive patients who were referred with suspected lung cancer. Study period was January 2007 to April 2007 (pre-TWR clinic) and May 2007 to August 2007 (post-TWR clinic). The patients referred under TWR and non-TWR were compared. Different pathway times, type of the tests and treatments given were analysed. Statistical analysis was done using SPSS package (Chicago, USA). Results: Analysing pathway times, no difference was found in time from referral to first seen between pre-TWR and post-TWR period, 6.3 ± 0.3 and 6.3 ± 0.4 (days, mean ± SEM, respectively). There were no breaches in “14 days target”. In the TWR group times from first seen to first diagnostic test (usually computed tomography; CT), between first and second diagnostic test (usually bronchoscopy/CT FNA; improved in the non-TWR group also), from first seen to definitive diagnosis have significantly improved after the clinic was set up (see table). If the second test was non-diagnostic and additional testing was required this resulted in significant delay from first seen to definitive diagnosis compared with other patients—35.6 ± 4.6 and 7.8 ± 1.3 (days, mean ± SEM, respectively). Similar findings were in the non-TWR group. It also prolonged time from referral to first treatment given. There was no improvement in time from referral to first treatment given after the TWR clinic was set up (see table). One “62-days target” breach pre-TWR and two breaches post-TWR clinic were detected. Shortest time to first treatment was found if palliative treatment was considered compared with surgery and chemo/radiotherapy treatment groups. Conclusions: There was no improvement in time from referral to first seen—all patients met the 14-days target. Setting up the TWR clinic significantly reduced times from first seen in clinic to first and second test and definitive diagnosis. Need for additional testing prolonged the time to definitive diagnosis and treatment significantly. Time to first treatment given remained unchanged after the clinic reorganisation. There was no significant improvement in the pathway times in the non-TWR group, except in time from first to second diagnostic test. Background: Few national data exist on the provisions of chronic obstructive pulmonary disease (COPD) services by the primary care organisations (PCO). In the national COPD audit 2008 we undertook a paper-based, self-reported survey of all 192 UK NHS PCO. Methods: In addition to structured questions, the survey invited the PCO to share examples of good or innovative practice either in action or planned for the near future. 48% (92/192) PCO responded. The information from this free text response was collated and systematically reviewed by two independent assessors using themed analysis. Identified themes of innovative practice: to minimise hospital admission. Remote monitoring of patient symptoms via “Telehealth”. Community outreach teams (mentioned 16 times). Both designed to allow early intervention in exacerbations. Another common strategy employed was the development of early discharge schemes (mentioned 13 times). Sub-theme analysis identified differences between innovations aimed at early detection of symptoms versus those aimed at admission avoidance. Service development: the development of community-based end-of-life services (mentioned 10 times). Plans for increasing community-based pulmonary rehabilitation, oxygen assessment and multidisciplinary COPD teams addressing issues such as smoking cessation. Sub-theme analysis pointed to differences between the introduction of new posts implementing a range of services, eg, community matrons versus more “singular” services such as community spirometry and oxygen assessments. Education and training: a large emphasis has been placed on educating both patients and healthcare providers (mentioned 15 times). Strategies adopted include educational audiovisual aids for patients, self-management plans and qualifications such as the COPD diploma. Discussion: There are a number of interesting innovative concepts under development in primary care. Many involve areas of practice traditionally associated with hospital care, eg, spirometry, oxygen assessment and education and training. Most developments appear to involve only PCO working in isolation from secondary care. Evaluation and cost effectiveness of services do not merit a high profile. Conclusion: It is encouraging to see that substantial work is being undertaken to improve clinical outcomes in COPD but it is imperative that PCO work in conjunction with secondary care to develop a coordinated approach delivering an efficient, cost-effective and holistic first-class care for our patients. Introduction: The effect and type of social marketing on increasing awareness and case-finding in chronic obstructive pulmonary disease (COPD) has not been fully assessed yet. Moreover, experience in the use of social marketing in improving healthcare remains limited, and optimal marketing models in this arena are far from complete. Methods: A marketing campaign was commissioned from a private marketing firm and aimed to increase awareness of COPD among the public using the following methods: high visibility posters on bus stops and GP practices particularly targeting areas of high deprivation; COPD information leaflets distributed with the local newspaper; free information line on COPD; how to get tested and how to access COPD services. Outcomes: Measured as follows: number of phone calls made up to 4 weeks after the end of the campaign; number of individuals presented to their GP for spirometry driven by the campaign; questionnaires sent out to members of the public. Results: During the campaign (2 weeks, April 2008) 60 posters and 40 000 leaflets were distributed. The cost of the campaign was £35 000. Only nine phone calls were made to the free phone line and 10 members of the public came forward for spirometry driven by the campaign (all normal tests). A total of 400 questionnaires were sent with 35% response rate (74% members of the public, 7% carers and 4% staff). Posters on bus stops and GP practices were seen/remembered by 15% of respondents. The majority of those who remembered seeing the posters/leaflets appreciated the message within and the advice on smoking, lifestyle changes and lung testing. Only one respondent remembered the leaflet sent out with the newspaper. Conclusions: Although posters and leaflets from this campaign were somehow visible and the main message was largely understood by those seeing them, this did not translate to individuals coming forward for spirometry. However, it would be very difficult to assess accurately the impact of such a campaign on lifestyle changes particularly on smoking cessation. This form of marketing was costly and not effective in case finding. Further research with possibly different models is required. Introduction: Chronic obstructive pulmonary disease (COPD) is a major burden on health resources in the UK. Direct costs in the form of GP services, medication and hospitalisations total £819.42 per patient per year.1 Despite this there is little national data on the provision of services for COPD patients by primary care organisations (PCO). In the national COPD audit 2008 we undertook a paper-based, self-reported, organisational survey of all 192 UK NHS PCO. Results: Responses were received from 73% (141/192) PCO. We noted a wide range of job roles among staff tasked with developing COPD services (111 different job roles among 156 individuals). Only 31% (49/156) of “service leads” had a clinical background. Notably, of the 19 doctors identified as COPD leads, 11 worked in Scotland. The current COPD service provision is reported in the figure. 86% (119/139) of PCO reported they had a defined group responsible for developing new COPD services and 50% (70/140) of PCO a written plan for these developments with a further 39% aiming to produce one. Service development plans (in the 50% with a plan) included: pulmonary rehabilitation 97%, early discharge scheme 90%, admissions avoidance 93%, palliative care 78%. 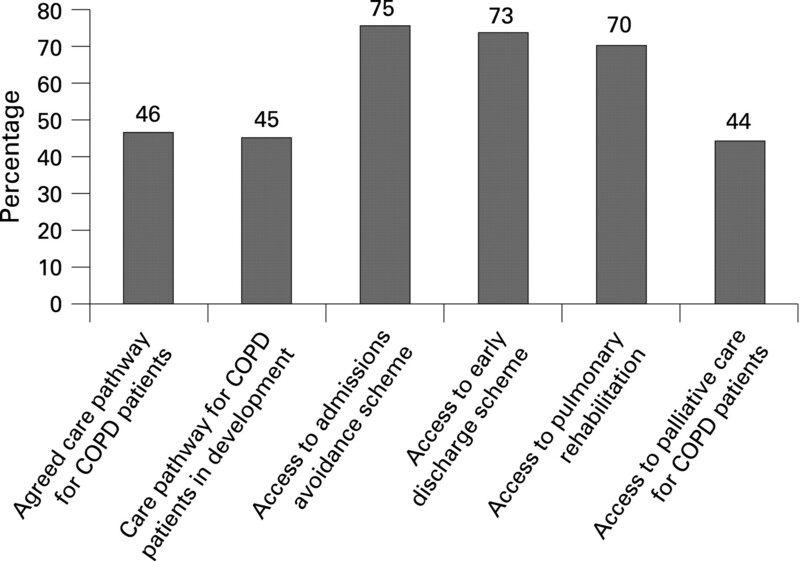 Discussion: Almost three-quarters of PCO have arrangements for admission avoidance and early discharge schemes with slightly less having pulmonary rehabilitation programmes. Patient pathways, however, were agreed in less than half of PCO although they were under development in a further 40%. A high proportion of PCO had either an existing written plan to develop services further or were in the process of producing one. Of some concern was that only a third of those responsible for planning had a clinical background and in only 12% were these doctors. Conclusion: COPD services are currently available and being developed further in most PCO but there is an emphasis on those related to admissions whereas others, eg end-of-life care, appear to have lower priority. Clinicians need to engage actively in the shaping of COPD services to ensure that the whole range of patient needs are met. Abstract P22 Figure Reported service availability in PCOs.
. Resp Med 2003;97(Suppl C):S71–9 . Background: A clinical decisions unit (CDU) was established in our regional cardiothoracic unit to achieve the 4-h waiting targets in accident and emergency departments. Originally it was for “open access” medical admissions, thoracic surgical inpatient referrals have now been processed via the same system. We have reviewed the effect of this change in admission policy on our processing of inpatient thoracic surgical transfers. Patients/Methods: A prospective audit identified that 63 patients with respiratory conditions were transferred to our institution for surgical review and management over a period of 6 months. The outcome measures analysed were referral to transfer time, transfer to surgery time and the length of inpatient stay. Results: Data are expressed as median (range). 63 patients (38 male and 25 female, median age 57 years (range 19–81)) were admitted over a period of 6 months. Patients were transferred from district general hospitals with a travel distance of 40 miles (5–50). The admission diagnosis included: 19 patients with persistent spontaneous pneumothorax; 15 with airways obstruction; 11 with malignant pericardial/pleural effusions; 10 patients with pleural empyema and eight patients with miscellaneous conditions. The time between referral and admission was only 17 h (1.5–119) with 68% admitted within 24 h. For the 50 patients who underwent operation, the time between the admission and surgery was 45 h (02–292) with some patients proceeding to theatre directly from CDU. For all patients, the length of inpatient stay was 4 days (0–22) (see table). Conclusion: Opening the access to a medical admission unit to thoracic surgical referrals results in efficient processing of patients who would otherwise occupy medical beds. Further efficiency could be achieved by increasing access to the operating theatre. Introduction: Patients referred to respiratory clinics (non-2-week rule) often make several journeys to hospital before starting treatment (consultation, diagnostics, treatment). Current NHS guidelines stipulate all diagnostics should be arranged within 6 weeks. We started a clinic where patients get chest x ray, blood, ECG, full spirometry with reversibility and consultation on the same morning in our district general hospital (DGH; situated in a rural area where the two nearest DGH are 38 and 53 miles apart). Methods: Retrospective comparison was done in consecutive patients attending the general respiratory clinic (GRC1) with one-stop clinics (GRC2) from January 2008 until July 2008 looking at the reason for referral, distance patients travelled, time taken to have spirometry, diagnosis and number of freed up slots. Distance travelled was calculated using the AA road map calculator based on post codes. Data presented as mean ± SEM. Results: 46 patients in GRC1 (mean age 61 ± 2 years, 31 male) compared with 47 patients (mean age 60 ± 3 years, 29 male) in GRC2. Patients in GRC1 made three journeys (mean distance travelled 45 ± 6 miles) to hospital before treatment was started, compared with 13 ± 2 miles in GRC2 (p<0.05). Patients in GRC1 had spirometry performed on average 37.6 ± 3 days post-referral compared with 0 in GRP2 (p<0.05). Patients in GRC1 had an average body mass index of 28.8 ± 0.9 versus 29.2 ± 0.9 in GRC2 (p = NS). There was no difference in provisional diagnosis prior to spirometry between groups (asthma 19 vs 18 (p = NS); chronic obstructive pulmonary disease 12 vs 14 (p = NS) and pulmonary fibrosis 7 vs 7 (p = NS)) and finding GRC1 versus GRC2 (43% vs 38% normal spirometry, 37% vs 34% obstructive and 20% vs 20% restrictive). Reversibility was done in 16 patients in GRC1 versus 19 in GRC2. 47 follow-up clinic slots were freed up in GRC2. Conclusion: One-stop diagnostic clinics provide an efficient and patient-friendly way of ensuring rapid diagnosis. This significantly reduces travel time and number of journeys to hospital (hence expenses and could be argued as environmentally friendly). There was no significant difference in patient (and diagnosis) distribution in the two groups. Diagnostic time was significantly lower in GRC2. This approach ultimately frees up clinic slots and makes service efficient. Quality of patient care and targets are both achieved. We encourage other units to try similar services. Methods: This retrospective audit was carried out between 13 and 26 November, inclusive. All patients who received a D-dimer test in the accident and emergency department as part of their initial assessment were included. For these patients the initial clerking was then assessed to see whether pulmonary embolism was part of the differential diagnosis, whether the BTS guidelines scoring system for pulmonary embolism was used, and who ordered the D-dimer test. Patients with a suspected deep vein thrombosis were excluded from the study. Results: Over the 14 days 77 cases were eligible for the study. 59 sets of notes were available. Of these, in 18/59 (30.5%) pulmonary embolism was part of the differential diagnosis. The BTS scoring system was documented in 2/18 (11.1%) of these clerkings. 11/59 (18.6%) were admitted for further imaging for suspected pulmonary embolism of which 8/11 (72.7%) were appropriate in accordance with the BTS guidelines. 33/59 (55.9%) of D-dimer tests were not ordered by a doctor. Conclusion: Over two-thirds of D-dimer tests were unnecessary as pulmonary embolism was never part of the differential diagnosis. They originated from a local guideline that encourages all possible blood tests to be ordered on admission to minimise 4-h breaches. The consequence is that one to two patients per week are exposed to unnecessary radiation and admission, with associated cost. Junior clinical staff are not being modelled good clinical practice in assessing for suspected acute pulmonary embolism. This is one example of how government targets are affecting high quality, evidenced-based clinical care and teaching of juniors. British Thoracic Society guidelines for the management of suspected acute pulmonary embolism. Thorax 2003;58:470–84 . Introduction: Medical inpatients typically have multiple co-morbidities and risk factors for venous thromboembolism (VTE) with estimated incidences of VTE being up to 20%. Primary thromboprophylaxis (pTP) could reduce this by 50%. Despite the SIGN guidelines (www.sign.ac.uk/guidelines)) being available to identify and prophylactically treat patients at risk of VTE (PRoVTE), compliance with SIGN guidelines is often suboptimal. Identifying the Issues: A preliminary audit in 2005 across the division of medicine (DoM) of our hospital showed our compliance to be <10%. Incorrect doses of prophylactic low molecular weight heparin (pLMWH) were often prescribed. The reasons identified for this included clinician awareness and priority setting at the bedside: clinicians focussing on treating immediate life-threatening problems rather than preventing a potential future one. The Initial Solution: Implementing educational programmes for junior doctors and a system of annual DoM-wide re-audits of pTP practice, using a robust audit design (fig), devised to ensure that all aspects of the SIGN guidelines recommendations were looked at. Case notes and drug cards of medical inpatients on 11 medical wards during a 4-day period of study (in 2006 and 2007) were scrutinised for patient and clinical details and the prescription (or not) of pLMWH/warfarin or an alternative (TED stockings) when LMWH is contraindicated. Patients were categorised into: group A: SIGN guidelines recommended (SGR) pLMWH given; group B: SGR pLMWH contraindicated: patient already anticoagulated for another indication; group C: LMWH contraindicated due to internal haemorrhage risk; alternative pTP used; group D: SGR pTP (LMWH or alternative) not followed; group E: pTP not recommended and group F: SGR unclear. Compliance = n(groups A + B + C), n(groups A + B + C + D). Results: Compliance was only 18% across the DoM when re-audited in 2006, despite 83% of patients being identified as PRoVTE. Despite much discussion of these results across the DoM, the 2007 re-audit showed little change in practice, although the PRoVTE was 92%. Conclusion and Change of Practice Implemented: Simple awareness of SGR pTP appears not to improve compliance. PRoVTE being 83–92% of all medical inpatients, we felt justified to implement a DoM-wide policy of mandatory pTP for all admissions (unless contraindicated) to improve compliance with pTP guidelines. 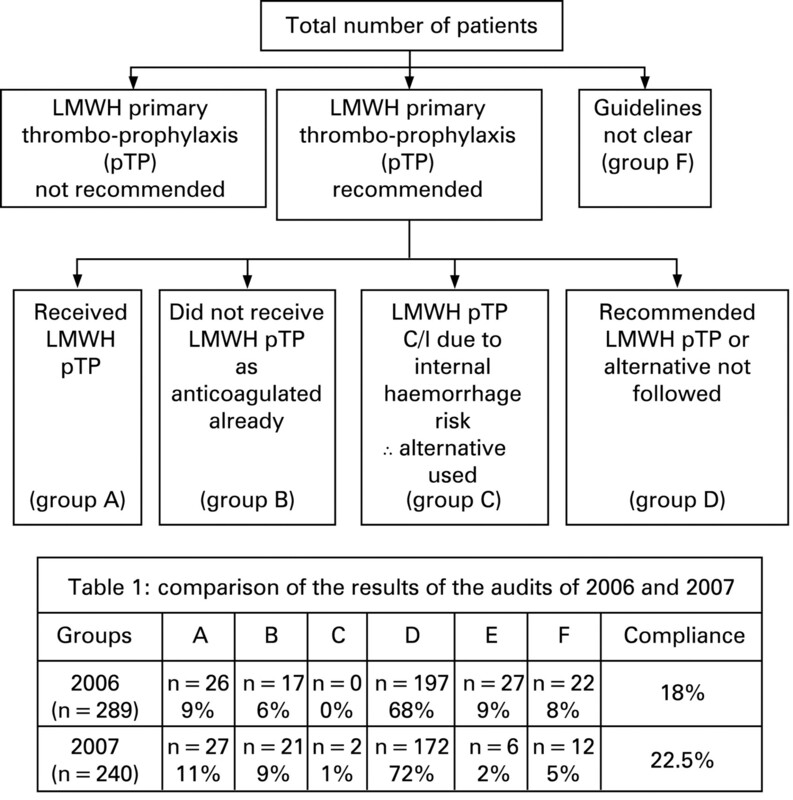 P27 PRIMARY THROMBOPROPHYLAXIS IN COMMUNITY HOSPITALS: THE UNMET NEED TO EXTEND THROMBOPROPHYLAXIS GUIDELINES FROM SECONDARY CARE INTO PRIMARY CARE? Medically ill patients admitted to secondary care hospitals (ScH) have multiple co-morbidity that bestow an increased risk of developing venous thromboembolism (VTE), with estimated incidences of up to 20%. Compliance in ScH with guidelines (eg, SIGN guidelines (www.sign.ac.uk/guidelines)), developed to reduce this risk with appropriate primary thromboprophylaxis (pTP), is often suboptimal. Ways to improve compliance are much debated, especially following the Chief Medical Officer’s statement on VTE risks in ScH. Medically ill patients in ScH are often discharged into community hospitals with GP or nurse-led inpatient units, as an interim measure for rehabilitation and respite and for minor illnesses threatening independence without necessitating ScH admission. These medically ill patients at the community hospitals have the same increased VTE risk as those in ScH and often have prolonged length of inpatient stay (LOS). The practice of pTP in community hospitals is unknown. In this study we audited compliance with the SIGN guidelines in the four community hospitals provided by Middlesbrough, Redcar and Cleveland Community Services. Methods: Case notes of medically ill patients in the four community hospitals were scrutinised for demographic profile, primary diagnosis, secondary diagnoses, LOS, prescription (or not) of pTP as low molecular weight heparin (LMWH) or warfarin prescription for a specified indication. Patients were categorised into: group A: SIGN guidelines recommended LMWH pTP given; group B: SIGN guidelines LMWH pTP contraindicated as warfarin already prescribed; group C: SIGN guidelines LMWH pTP not followed; group D: SIGN guidelines LMWH pTP contraindicated due to internal bleeding risk or end-of-life care pathway and group E: SIGN guidelines unclear or pTP not recommended. Compliance (%) = n(group A + B) ÷ n(groups A + B + C) × 100. Results: Data from 91 patients (47 female) were available. The mean age and LOS were 79 years and 39 days, respectively. The table shows patient numbers in each group. Compliance with SIGN guidelines was therefore 35%. Two patients in group C developed VTE during their current admission. Conclusions: There is an opportunity to optimise pTP use in the community hospital to reduce VTE-related morbidity. The point at which medically ill patients are considered mobile enough no longer to need pTP remains hard to define. Given the mean LOS this would have significant financial and workforce implications. Introduction and Objectives: In 2007 an algorithm was introduced to guide risk stratification and management of patients with suspected pulmonary embolism (PE). It featured guidance on assessment for safe outpatient management and assessing patients with confirmed PE for early discharge. This study aimed to assess whether PE management with low molecular weight heparin as an outpatient, as in deep vein thrombosis (DVT), is practical. Methods: The medical notes were retrospectively reviewed in all patients referred with suspected PE over a 5-month period from September 2007. The length of hospital stay, risk stratification using modified Wells score, outcome and whether the patients were managed as outpatients, were recorded. The criteria for ambulatory management in low/intermediate probability groups included: SaO2 >95% on air; respiratory rate <20/min; pulse <100/min; blood pressure normal for patient or >120/80 mm Hg; absence of right ventricular strain on ECG; normal troponin T and adequate social circumstances. Results: 320 patients were referred with suspected PE. A total of 275 notes were reviewed (45/320, 14% unobtainable). The diagnosis of PE was excluded by clinical examination and D-dimer in 52 (19%). The remaining 223 were stratified into 62 low (28%), 140 intermediate (63%) and 21 high risk (9%). A total of 239 CTPA and 31 V/Q scans were performed in 5 months with a 26% positive hit rate. In the low-risk group seven (11%) were found to have PE, in the intermediate group 44 (31%) and in the high-risk group nine (43%). The median (range) length of stay in the three groups was 5 days (0–97), 4 days (0–66) and 7 days (0–35) (low, intermediate and high) with 13% low (8/62) and 4% intermediate (5/140) probability managed as outpatients. All are alive and well. None of the high probability group was investigated as outpatients. 3% (7/223) were discharged early with community anticoagulation therapy. Conclusions: It is proposed that the trust could easily facilitate the care of many of these patients via the ambulatory care pathway in the same way as DVT is currently managed. With further education highlighting the safety and advantages of ambulatory care, we aim to improve the patient pathway, which will have potential financial advantages. Introduction: The North Bristol Lung Centre (NBLC) was formed in October 2006 to optimise the bed base, develop new services and pre-empt the north Bristol hospital development, serving a population of 500 000. Despite targeting respiratory admissions to the NBLC, there remained a need to provide respiratory support to the sister hospital; provided by a consultant-led respiratory opinion service. We examined the impact of providing this service on consultant workload since service reconfiguration. We hypothesised the demand would be small, diminish with time and be genuine. Methods: All 310 referrals seen at the sister hospital over a 6-month period (September 2007 to March 2008) were prospectively recorded and independently analysed for appropriateness and number of referrals per day. “Appropriate” was defined as requiring a specialist rather than a generalist opinion. Results: 2.68 (2.03) (mean, SD) referrals/day were seen, with significant inter-month variation from 1.68 (1.17) to 4.2 (2.6), p = 0.001 (analysis of variance; ANOVA). This equates to 1.34 h/day (1.68 PA/week), varying from 0.84 to 2.1 h/day (1.05 to 2.6 PA/week. February 2008 (2.6 PA/week) was significantly higher than November 2007 (1.4 PA/week), p<0.05 (Bonferroni) and December 2007 (1.1 PA/week), p<0.01 (Bonferroni). There was minimal diurnal variation in workload (range 2.29 (1.94)–3.52 (2.61)) referrals/day, p>0.05 (ANOVA). Approximately 19% required re-review reflecting case complexity. Most (91%) referrals were appropriate indicating a genuine need. Reasons for referral comprised suspected lung cancer (19.4%), airways disease (18.1%), pulmonary infection (16.1%), pleural disease (10.6%), interstitial disease (10%), ventilation/sleep disorders (8.7%) and pulmonary vascular disease (7.7%), but also a request for a diagnosis (9.4%). Conclusions: Following centralisation, the demand for a consultant-led respiratory opinion service proved genuine with disproportionate representation of complex problems. Demand has failed to diminish following reconfiguration; it has been significant and unpredictable requiring between 1.05 and 2.6 PA (mean 1.68) per week of consultant activity (increased further on recent data). This information may prove useful to providers considering service reconfiguration and to consultants in job plan reviews.